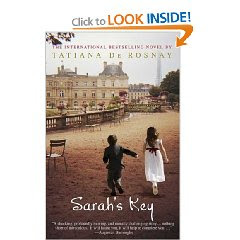 Sarah's Key: A Novel by Tatiana de Rosnay alternates between two characters who are experiencing the Vel’ d’Hiv roundup in France in very different ways. First is Sarah, a Jewish child living in France during World War II, who is arrested along with her parents during the roundup. To save her younger brother, she locks him in a hidden cupboard, taking the key with her, figuring she'll be back shortly to let him out. Second is Julia Jarmond, a journalist living in France in 2002, who stumbles upon Sarah's story while writing an article about the 60th anniversary of the roundup. She becomes determined to find out what happened to Sarah, and how their lives are connected. I read Sarah's Key over a year ago, but it's a novel that has stuck with me and probably always will. This was a difficult read due to the subject matter, especially as a mother of a 4 year old boy (at the time I read it). But it was definitely worth it. It's a very fast read that pulls you in so you don't want to put it down. For the first half, I found I was rushing through the sections taking place in 2002 so I could get back to see what happened next in 1942. But in the end, the more modern-day story held my attention. I've seen this novel described as "haunting" and I think this is the perfect word for it. The story is disturbing enough that I consciously block parts of it from my mind. To read about the suffering these children experienced is heart-wrenching. However, I would still highly recommend this book. It is a compelling book about a very important, but not well-known historical event. I had never read about the Vel’ d’Hiv roundup before. Hearing about France's involvement in the roundup of thousands of Jews, particularly the children who were taken during this time, was awful but enlightening as well. This review was written based on a copy of Sarah's Key that I purchased. Great review! I received this book from my book blogger Secret Santa and am looking forward to reading it. I didn't know that part of the story took place in modern times. That's cool. Glad to hear it was such a great and memorable read.